For some unknown reason just like many other mothers, I avoided pumping bra. Somehow, i didn't visualize that a bra could help me during pumping breast milk. Pumping bras for me were unnecessary and over-hyped pumping accessories until I used them for myself. The first time I used Medela easy expression​, I realised how stupid I have been to not use medela breast pump bras. Since, I am an exclusive pumper, I saved more than 60 minutes everyday and managed my chores also. This forced me to write Medela Easy Expression Hands Free Bustier review. With Medela Easy Expression Hands-Free Bustier, you can pump and have your hands free for some other work or just relax! In our Medela Easy Expression Hands Free Bustier review, we found that it's almost a perfect hands free bra which works with most electric breast pumps and especially Medela Pump In Style and Medela Freestyle. The Medela pump bra is good with most electric pumps, including Medela Swing, Swing maxi, Spectra S2, Medela ﻿﻿Freestyle and Medela Symphony. Medela Hands free bra is made of a cotton and spandex mix that holds the shield and bottles safely and gives you opportunity to do different things while pumping. I personally found Medela hands free bra very comfortable on my skin and didn't experience any rashes. Wearing and using Medela hands free pumping bra as simple as it can get. I used to just wear it, zip it and attach the milk bottles. Once I started my breast pump, which was the Medela Pump In Style my case, it was a total hands-free experience for me. I used to pump 3-4 times a day with each session lasting 20 odd minutes. With use of medela hands free pumping bra, I was saving close to an hour everyday. You can locate the right size by utilizing the pumping bra size calculator that is mostly available online (at least I did that!). The bustier is machine washable. 44% OFF onMedela Easy Expression Hands-Free Bustier! Gives you the flexibility to do different things like work on laptop, tablet, phone while pumping milk. Easy to wear, use and wash.
Made of Cotton/Spandex blend (93% cotton, 7% spandex) which allows it to be worn on its own, or over a nursing bra or a camisole. The material conforms to Tex Standard 100 and can be machine washed at 30°C. Even though the holes for the shields are positioned a bit too broad, but still you can make it workable. No straps to help with putting it on. Elastic turns into somewhat uncomfortable if worn especially direct on the skin for a really long time. Elastic turns into somewhat uncomfortable if worn specifically on the skin for a really long time. 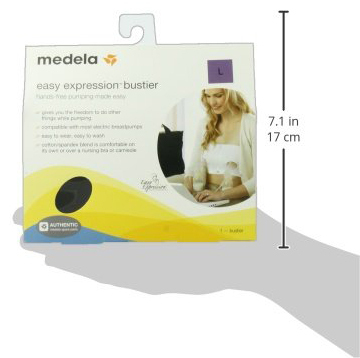 Medela Easy Expression Hands-Free Bustier will be very useful for anyone who uses electric breast pumps. It's suitable for both working moms or stay at home. It allows your hands to be free while you're pumping milk. If you're short on time or don't like holding the pump (who does? ), this hands-free bra is excellent as you can multi-task or just relax. I don't know why I didn't get this with my first child. It's super easy to use and holds my pumps snugly. Never had an leakage issue. Was careful in selecting the size. Why anyone would not use this while pumping is beyond me. 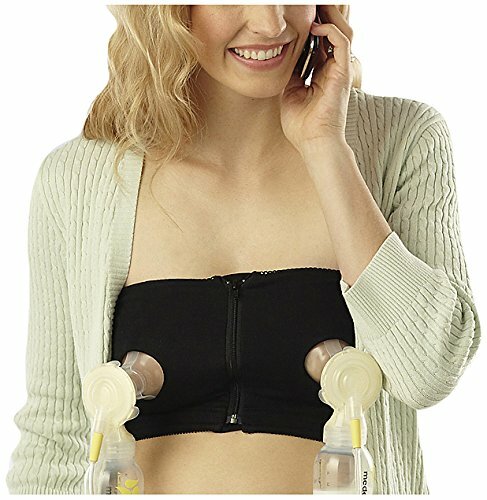 I can't even think of pumping without a hands free bra. The bra holds the pump very securely. I am way beyond satisfied. Amazed at how this bra frees up my hands. It is very comfy and I felt no irritation whatsoever. One thing to take care of is to check the sizing instruction before ordering. The material is soft and breathable. My life is chaotic and difficult anyways and with pumping I had more on my plate than I could chew. Pumping bra helped me. I would suggest every pumping mom to buy this without overthinking. you NEED it! My friend and hubby were quite adamant that I should give medela pumping bra a try. I was skeptical and didn't want to add another accessory to my already big list of accessories which you invariably get when you're using an electrical breast pump. So I ordered from Amazon. As soon as I got the package, i became unexpectedly excited about using it. I tried it immediately and started pumping. I was giggling all the time. I guess I was so happy that I could now blog while I am pumping. Now, my hands are never 'tied down' while pumping. I can multi task or just relax.